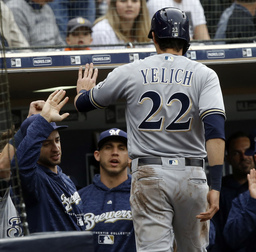 Milwaukee's bold offseason moves for Christian Yelich and Lorenzo Cain are working quite well so far. "It could be a fun year for the middle of the order," Shaw said. "Tonight's special; 2-3-4 get on, what, 10 times? Yelich with five hits. His bat-to-ball skills are unbelievable. He finds a way to get the barrel to the ball every single time no matter the count. He's fun to watch." "Anytime you do that there's always a little luck involved," he said. "There's some ground balls that just missed some people's gloves and they find some grass out there, but it's a good feeling. You get on base in front of the big guys, with Lo Cain, and start putting pressure on the other team every time you get out there and usually good things happen when you do that." Yelich, Cain and Shaw had 10 of the Brewers' 12 hits. Cain and Shaw each walked once. "They're a good team," San Diego manager Andy Green said. "You make mistakes to the heart of their order, they're going to make you pay. Those are real hitters in the middle of their order." With the Padres facing a right-hander, Ryan Braun was out of the lineup and left-handed hitting Eric Thames started at first and batted leadoff. Braun's impressive three-run homer capped a five-run rally in the ninth inning Friday night that gave Milwaukee an 8-6 win. "He has a picture-perfect swing," Braun said. "It's what you'd try to teach kids. It doesn't get much better than that." "It's two years on the roster. It's time for him to go, it's time for him to step up and attack," Green said of Perdomo. "The challenge is there out in front of him." Erlin was a candidate for the rotation coming out of spring straining. "Coming back from Tommy John, being out for a long time, I like where he is," Green said. "He gave us an opportunity to get back in that game. We just didn't put much on the board after that third inning."